Oscar Friberg has finally made an impact in a European competition with Ostersunds FK. After finishing 4th in last years Allsvenskan, Ostersund qualified for the Europa League qualifiers and managed to progress through to the Group Stage for the first time under Friberg. This post is the third and final post in our review of season 4. Do go and check out the posts below to find out how Ostersund performed in their 2020 domestic season. Did we qualify for next seasons Europa League? Before reviewing our own European campaign, let’s first take a look at the European Nation/Club Coefficients and if Sweden has improved since Friberg has been with Ostersund. At the beginning of our save with Ostersund, Sweden sit in 21st in the European league standings. This means that 1 club qualifies for the Champions League 1st Qualifying Round and three teams qualifying for the early stages of the Europa League. Ostersund fail to feature in the Swedish clubs listed on the club coefficients page in 2017. Swedish champions Malmo lead the way in 113th place with Elfsborg and AIK trailing behind them. Malmo exceeded expectations in the Champions League by reaching the group stage. However they lost every game and showed how much Swedish sides need to improve moving forward. Ostersund and Norrkoping backed up this notion by exiting at the 3rd Qualifying Round of the Europa League. A great year for Swedish sides saw three teams reach the group stages of the Europa League. Goteborg, reigning Swedish champions, were knocked out of the Champions League qualifying rounds but managed to reach the Europa League group stage and came 3rd in their group. This performance saw Sweden rise from 23rd to 15th in the nation coefficients table, meaning an increase in the number of continental qualification places available for Swedish teams. Ostersund returned to Europe in the 2019/20 season but failed in their quest of reaching the group stages. Malmo improved again by finishing third in their group but Norrkoping and Goteborg failed to get past the qualifying rounds. The 2020/21 season saw five Swedish clubs enter European competition. Norrkoping, on the back of three consecutive Swedish championships, failed once more to reach the Champions League group stages and, even worse, fell before reaching the Europa League groups. Malmo and Elfsborg (qualifying as a result of 5th place entering the Europa League for the first time) reach the knockout rounds of Europe’s second best competition. Impressive signs for Swedish clubs. And yes, Ostersund reached the group stage of the Europa League for the first time under Oscar Friberg’s management. Read on to find out how they managed it! Here you can see clearly how Sweden’s progression up the table increases the number of qualification places the Allsvenskan acquires. For the upcoming 2021 season, Sweden will have two clubs entered into the Champions League for the second time in a row. Ostersund breezed past Finnish side Ilves before facing Norwegian side Molde. Losing 1-0 away from home left us vulnerable – an away goal for Molde would mean we’d need three to progress. And this is exactly what happened. Molde grabbed an early away goal to lead 2-0 on aggregate. An incredible comeback saw Ostersund score three goals in the final twenty minutes to overturn the deficit and progress through to the 4th Qualifying Round. A very impressive comeback and one that was entirely unexpected. Austria Wien awaits us in the 4th QR. Despite losing the 1st leg again, we did score a crucial away goal. This confidence boosting goal helped us thrash the Austrian side on our home turf – we won 3-0 and reached the group stage of a continental competition for the first time in the save. We were drawn against Dutch side Vitesse, EPL side Tottenham and Hoffenheim from Germany. Ostersund can be proud of their performance in the group as they finished 3rd, beating Vitesse twice and earning two impressive draws against Tottenham and Hoffenheim, both at home. All in all a very impressive European campaign for Ostersund. And if you read the previous posts in our season, you’ll know that all of this is possible again next year after finishing 4th in the league season. Let’s hope we can push on even further in Europe next time! Thank you very much for reading another instalment of our Football Manager 2018 story here on VivaLaVidaFM. 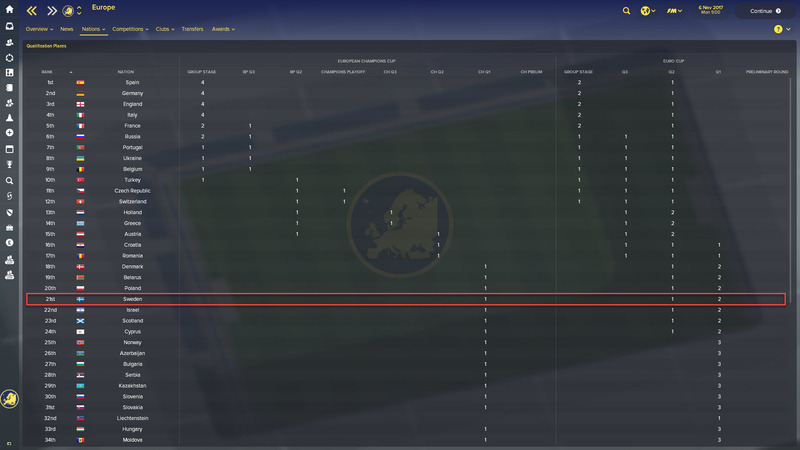 I was very pleased to be able to reach the Group Stage of the Europa League, especially as in real-life Ostersund played so well and reached the knockout stages of the 2017/18 competition! If you enjoyed this post, do leave a like or a comment and let me know what you think of our save so far. Be sure to follow me on Twitter as I will be posting many save updates there! This entry was posted in FM18 Stories, Football Manager 2018, Oscar Friberg, Ostersunds FK | @VivaLaVidaFM and tagged allsvenskan, europa league, fm stories, fm18, football manager, Oscar Friberg, ostersund, sweden. Bookmark the permalink.